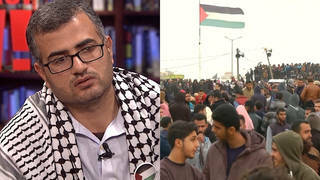 Leading Israeli Scholar Avi Shlaim: Israel Committing “State Terror” in Gaza Attack, Preventing Peace | Democracy Now! a professor of international relations at Oxford University who served in the Israeli army in the mid-1960s. He is the author of numerous books, most notably The Iron Wall: Israel and the Arab World. His latest book is Lion of Jordan: King Hussein’s Life in War and Peace. Avi Shlaim is widely regarded as one of the world’s leading authorities on the Arab-Israeli conflict. And I, for my part, have never questioned the legitimacy of the Zionist movement. I saw it as the national liberation movement of the Jewish people. Nor did I ever question the legitimacy of the state of Israel within its pre-1967 borders. What I reject, what I reject totally, absolutely and uncompromisingly, is the Zionist colonial project beyond the 1967 borders. So we have to distinguish very clearly between Israel proper, within its pre-1967 borders, and Greater Israel, which began to emerge in the aftermath of the June '67 war and has completely derailed the Zionist project. We've had a number of debates here on Democracy Now!, Professor Shlaim, over the past weeks about what’s happening in Gaza and those who support the Israeli military continually say that in 2005, three years ago, Israel pulled out of Gaza entirely. You have a different picture of what happened under Ariel Sharon in August of 2005. Explain how you see the withdrawal of Israeli military at that time. And let me add in parentheses that Gaza was a classic example of exploitation, of colonial exploitation in the postcolonial era. Gaza is a tiny strip of land with about one-and-a-half million Arabs, most of them — half of them refugees. It’s the most crowded piece of land on God’s earth. There were 8,000 Israeli settlers in Gaza, yet the 8,000 settlers controlled 25 percent of the territory, 40 percent of the arable land, and the largest share of the desperately scarce water resources. AVI SHLAIM: This is Israeli propaganda, and it is a pack of lies. The important thing to remember is that there was a ceasefire brokered by Egypt in July of last year, and that ceasefire succeeded. So, if Israel wanted to protect its citizens — and it had every right to protect its citizens — the way to go about it was not by launching this vicious military offensive, but by observing the ceasefire. Now, let me give you some figures, which I think are the most crucial figures in understanding this conflict. Before the ceasefire came into effect in July of 2008, the monthly number of rockets fired — Kassam rockets, homemade Kassam rockets, fired from the Gaza Strip on Israeli settlements and towns in southern Israel was 179. In the first four months of the ceasefire, the number dropped dramatically to three rockets a month, almost zero. I would like to repeat these figures for the benefit of your listeners. Pre-ceasefire, 179 rockets were fired on Israel; post-ceasefire, three rockets a month. This is point number one, and it’s crucial. And my figures are beyond dispute, because they come from the website of the Israeli Foreign Ministry. But after initiating this war, this particular table, neat table, which showed the success of the ceasefire, was withdrawn and replaced with another table of statistics, which is much more obscure and confusing. Israel — the Foreign Ministry withdrew these figures, because it didn’t suit the new story. And there is one other point that I would like to make about the ceasefire. Ever since the election of Hamas in January — I’m sorry, ever since Hamas captured power in Gaza in the summer of 2007, Israel had imposed a blockade of the Strip. Israel stopped food, fuel and medical supplies from reaching the Gaza Strip. One of the terms of the ceasefire was that Israel would lift the blockade of Gaza, yet Israel failed to lift the blockade, and that is one issue that is also overlooked or ignored by official Israeli spokesmen. So Israel was doubly guilty of sabotaging the ceasefire, A, by launching a military attack, and B, by maintaining its very cruel siege of the people of Gaza. But there are two points I would like to make about Hamas, and that is — the first point is that it was elected in a fair and free election in January 2006. It was an impeccable election, monitored by a number of international observers, including President Jimmy Carter. So it is not just a terrorist organization. It is a democratically elected government of the Palestinian people and the representative of the Palestinian people in Gaza, as well as the West Bank. AVI SHLAIM: The solution — this is a political conflict, and there is no military conflict to — there is no military solution to this conflict. The only solution lies in negotiations between Israel and Hamas about all the issues involved. President-elect Obama is a very impressive man and a very intelligent man and a very fair-minded man. He hasn’t demonstrated any courage in the course of this crisis. He hasn’t taken any position. He hasn’t called for an immediate ceasefire. So the first step is an immediate ceasefire, and the next step would be negotiations between all the sides about restoring the ceasefire and then moving on to stage two, which is a political settlement to this tragic hundred-year-old conflict. AMY GOODMAN: Professor Avi Shlaim, thank you very much for being with us. Professor Avi Shlaim, professor of international relations at Oxford University, served in the Israeli military — among his books, Lion of Jordan: King Hussein’s Life in War and Peace — known as one of the leading authorities in the world on the Israel-Palestine conflict and Arab-Israel conflict. Among his other books, The Iron Wall. NEXTWhite Phosphorous and Dense Inert Metal Explosives: Is Israel Using Banned and Experimental Munitions in Gaza?